Bigos is a traditional stew typical of Polish and Lithuanian cuisines that many consider to be the Polish national dish. A savory stew of cabbage and meat, there is no standard recipe, as recipes vary considerably from region to region and from family to family. Typical ingredients include fresh and fermented white cabbage (sauerkraut, kapusta kiszona in Polish), various cuts of meat and sausages, often whole or puréed tomatoes, honey and mushrooms. The meats may include pork (often smoked), ham, bacon, beef, veal, sausage, and, as bigos is considered a hunters' stew, venison or other game; leftover cuts find their way into the pot as well. It may be seasoned with pepper, caraway, juniper berries, bay leaf, marjoram, pimento, dried or smoked plums and other ingredients. 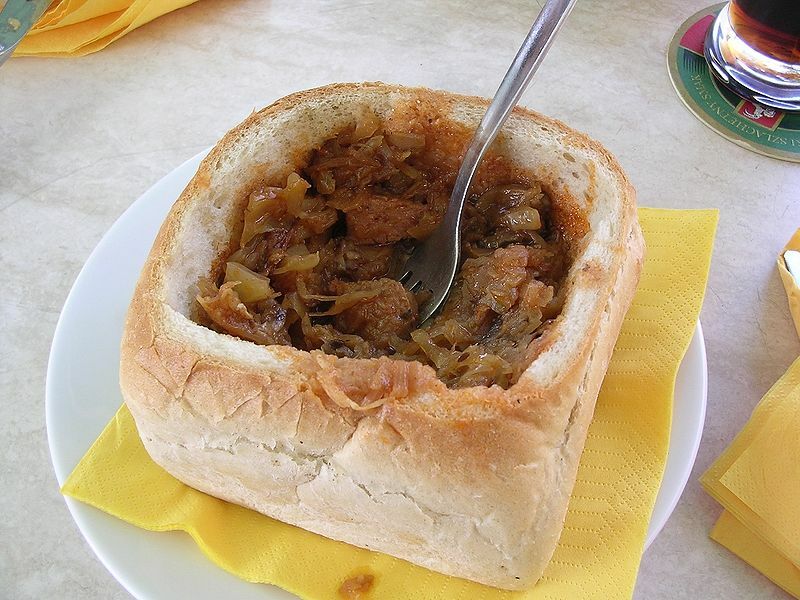 Bigos is usually eaten with rye bread and potatoes. As with many stews, bigos can be kept in a cool place or refrigerated then reheated later—its taste actually intensifies when reheated. A common practice is to keep a pot of bigos going for a week or more, replenishing ingredients as necessary. This, the seasonal availability of cabbage and its richness in vitamin C made bigos a traditional part of the winter diet in Poland and elsewhere. In Poland, it was a traditional dish to be served on the Second Day of Christmas. The dish is based on sauerkraut. More than one type of meat is used. Kielbasa (sausage) is included among the meat. Plenty of peppercorns are used. The following recipe gives a representative example of bigos. Because preparation varies so widely, many variations have their adherents. Prepare the ingredients as listed on the left. Simmer the cabbage until soft (1/2 to 1 hour), then drain. Meanwhile, cook the bacon and set aside, preserving the fat. In the bacon fat sauté the onions and garlic, and brown the remaining meat except the kielbasa. Combine all ingredients in a pot and cook: in a slow cooker, set on "low" for 5–10 hours; on the stove, cook briefly on medium and then simmer 2–3 hours. Refrigerate any leftovers and reheat for serving. The flavor improves each time, peaking around the third day.